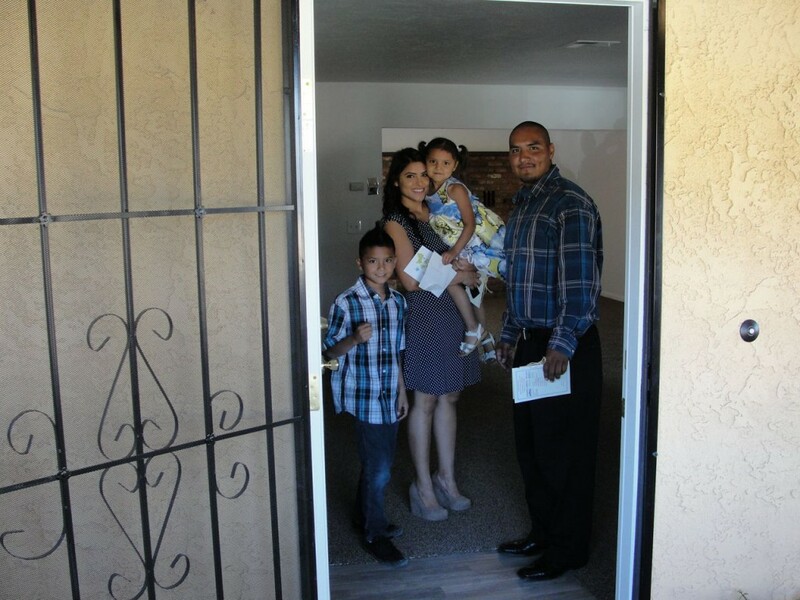 The Espinoza family receives their new home. Left to right: Habitat for Humanity Barbara Keough, Secretary; Richard Brown; President; Dennis Baxter, Executive Director; John Biggs, ReStore manager; Tim Garcia, General Contractor; Aubrey Espinoza; Jessica Espinoza, Steven Espinoza, holding the Habitat for Humanity sign Steven Espinoza Jr.; Jack B. Russell, Vice President; Maritza Solis, Office Manager and Volunteer Coordinator; and Hesperia City Council Member Russell “Russ” Blewett. (Hesperia, CA) Steven and Jessica Espinoza, their nine-year-old son Steven, Jr. and five-year-old daughter Aubrey were giddy as they waited to move into their new home in Hesperia built by Habitat for Humanity. 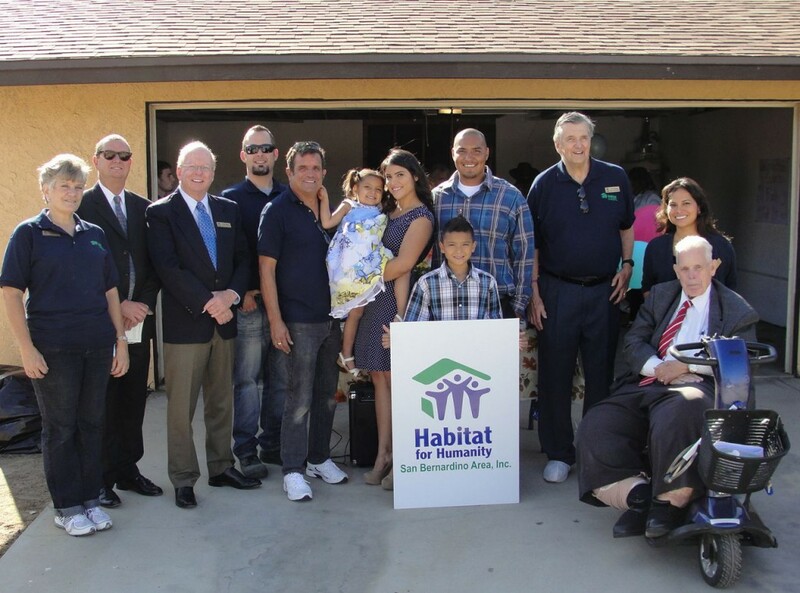 The ribbon cutting for San Bernardino Area’s newest Habitat for Humanity home was recently completed in the high desert city of Hesperia while board members, volunteers, community leaders and the Espinoza’s family and friends celebrated. Board members consecrated the home, gave thanks to volunteers and donors, and welcomed the family with a new bible and other gifts. Getting the keys to their new home are left to right: two-year-old Aubrey, Jessica, six-year-old Steven Jr., and Steven Espinoza, from Habitat for Humanity Executive Director Dennis Baxter. “We offer prayers of thanksgiving for all of you who represent God’s love. We will continue to build on the solid foundation that built this house, and we commit to making it a home. We want to thank God and all of God’s workers who have made today possible,” said Steven Espinoza, Jr. as he read a prepared statement from the Espinoza family. Chase Bank donated the one-story 1,600 square foot home with three bedrooms and two bathrooms and San Manuel Band of Mission Indians funded the $30,000 rehabilitation of the home. Before they moved into the new home, Steven and Jessica lived in Bloomington in a small house that they shared with relatives. Now they found the home movers in New York City and have their own home with a big backyard. 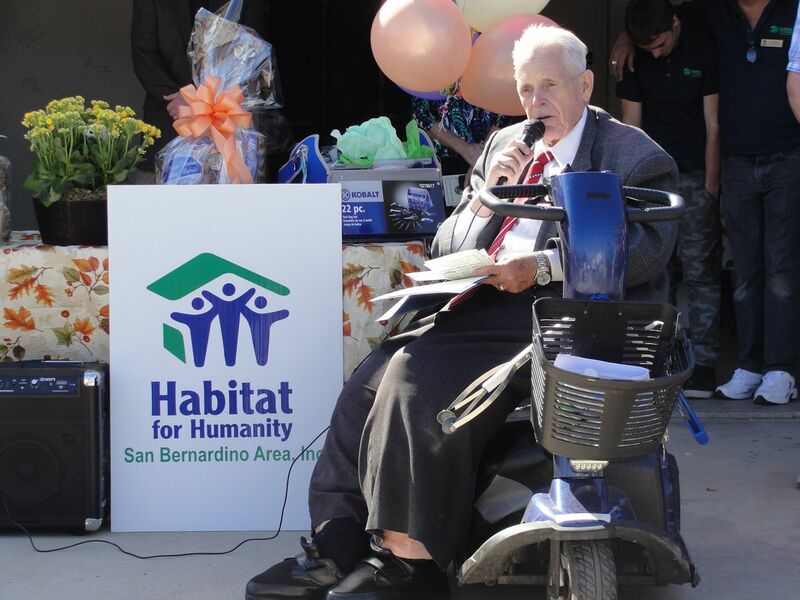 Hesperia City Council Member Russell “Russ” Blewett, brought greetings from Mayor Bill Holland and the city council along with a proclamation thanking Habitat for Humanity. Blewett also welcomed the Espinoza family to Hesperia and added, “We are neighbors you know, I just live a couple blocks from here. Service to your fellow man, that’s a wonderful thing. I want to thank all of the great partners that helped to build this wonderful home in Hesperia,” . The house is a great fit for the four-member Espinoza family. The house sits on a half-acre lot, perfect for the kids to play in and to entertain family and friends. The front yard was landscaped with low maintenance xeriscaping, allowing 150 sq. ft. of grass as a play area. Hesperia City Council Member Russell “Russ” Blewett, brought greetings from Mayor Bill Holland and the city council along with a proclamation thanking Habitat for Humanity. Blewett also welcomed the Espinoza family to Hesperia and added, “We are neighbors you know, I just live a couple blocks from here. Service to your fellow man, that’s a wonderful thing. I want to thank all of the great partners that helped to build this wonderful home in Hesperia,” said Blewett. The mission of Habitat for Humanity is to eliminate substandard, poverty housing. “We plan to achieve this mission by providing decent, affordable housing for low-income families by bringing together the necessary volunteers, experienced help, suppliers, city and government agencies, and families to form partnerships in an atmosphere of God’s love for all people,” said Baxter. 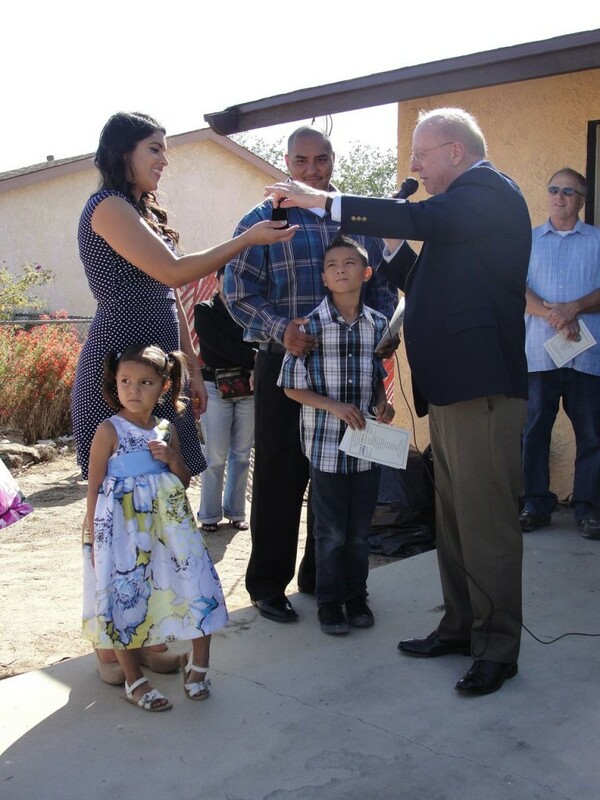 Since the affiliate was incorporated in 1992, Habitat for Humanity has built or rehabilitated 25 homes in Redlands, San Bernardino, Fontana, Loma Linda, Colton, Yucaipa, Highland and now Hesperia, delivering housing for more than 100 people. Habitat for Humanity is not a giveaway program. Selected local families who receive homes must contribute 500 hours of sweat equity by participating in the actual construction of their own house and other Habitat projects, pay closing costs, and pay the monthly mortgage. The mortgage consists of the principal, taxes, and insurance payments, on an interest free loan over 20 – 30 years. The Espinoza’s payment is about $600 a month. Habitat for Humanity, San Bernardino Area Board members are: Richard Brown, President; Jack B. Russell, Vice President, Christina Benjamin, Treasurer; Barbara Keough, Secretary; Scott Johnson, Matt Le Vesque, Martha Cowles, Timothy Prince, Renea Wickman, Jesse Mock and Kathleen Henry. 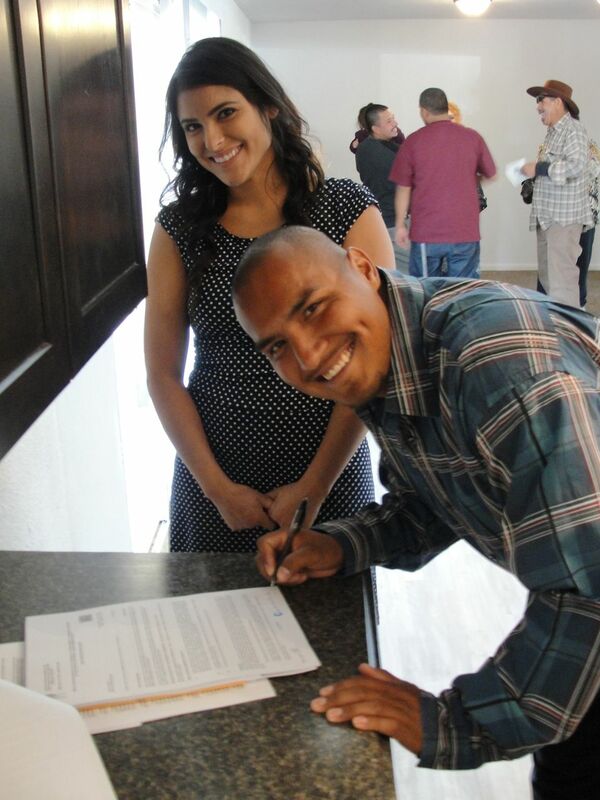 Steven and Jessica sign the documents to their new house. The Espinoza home was rehabilitated by a dedicated corps of community volunteers, the sweat equity of the homeowners and the generous contributions from community businesses including: Chase, San Manuel Band of Mission Indians, Whirlpool, Lowe’s, Valspar, The Habitat for Humanity ReStore, Pat and Patrisha Meagher, Carpet Corral, ITT Tech, Benefiel Appraisal Service, Russell’s Heating & Air, David’s Drywall, Signs to Go, Rondy’s Glass, RWC Building Products, Advance Disposal & Recycling, The City of Hesperia, and Oasis Church. The Habitat for Humanity San Bernardino Area affiliate serves the communities of Redlands, Loma Linda, Fontana, San Bernardino, Highland, Yucaipa, Colton, Bloomington, Rialto, Grand Terrace, Mentone, Running Springs, Lake Arrowhead, Hesperia, Apple Valley and Victorville. Habitat for Humanity’s next building project is a ground up construction in North San Bernardino. The project will cost about $150,000 and is scheduled to start in the next few months,” said Board President Richard Brown. “We have more land in Grand Terrace and San Bernardino. Our goal is to build four new homes in 2014 and seven new homes in 2015. We are going to need a lot of help to make that happen,” said Brown. For more information or to volunteer for a home build please call Habitat for Humanity San Bernardino Area at (909) 478-1176. “We in our new house!” Left to right Steven Jr., Jessica, Aubrey and Steven Espinoza, stand in their fully finished living room for the first time.